BEIJING (Reuters) - China's civil aviation regulator has stopped taking applications for Boeing's 737 Max 8 airworthiness certification since March 21, an official at the regulator's news department said on Tuesday. China was the first to ground the newest version of Boeing's workhorse 737 model earlier this month following a deadly Ethiopian Airlines crash, prompting a series of regulatory actions by other governments worldwide. The official did not provide any other details. 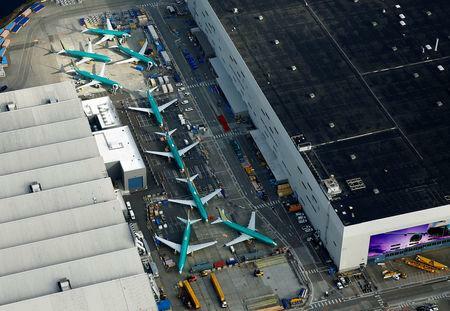 "Given the aircraft faces uncertainties in its airworthiness, after studying, it is decided that (the regulator) will stop issuing Boeing 737 Max 8 airworthiness certification immediately," the CAAC was quoted by Caijing as saying, adding that the ongoing investigation had not ruled out the possibility of an aircraft design issue. The regulator also said it will only resume reviewing applications when it is determined that the aircraft is airworthy and it has sent staff to take part in the investigation and to review design changes, according to Caijing. It took Boeing 15 months to get the airworthiness certification for the aircraft from CAAC, which it obtained in October 2017, Caijing said, citing industry insiders. Boeing did not immediately respond to a Reuters request for comment.